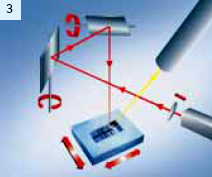 Redirect mirror moves the laser to the workpiece to remove material at angles of as liitle as 10-15°. 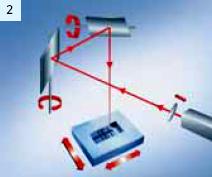 Option S: the laser slanting and continuously repositioning of the workpiece allow machining of vertical walls with a maximal wall angle of 90 ° (depending on the material and the depth). 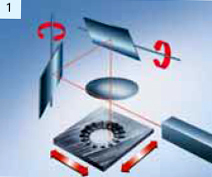 Option I: the integrated in-process control allows contact-free surface adjustment during machining.